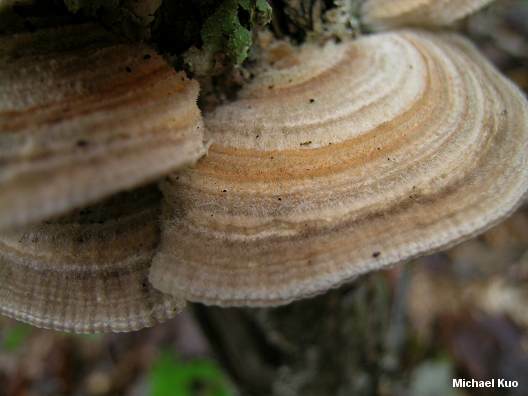 From above, Lenzites betulina looks for all the world like Trametes versicolor or Trametes hirsuta, with its fuzzy, zoned cap. But flip it over and you will find that this little polypore has gills! We're talking true gills here, not the maze-like or "nearly gill-like" pores of polypores like Daedaleopsis confragosa and similar mushrooms. 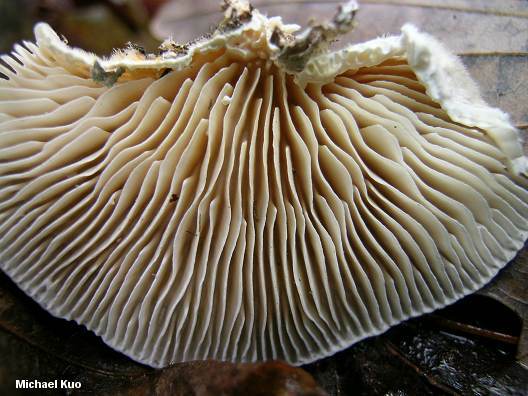 If the notion of a polypore with gills strikes you as oxymoronic, I can't argue with you--but see the essay below, "What, If Anything, Is a Gilled Mushroom?" 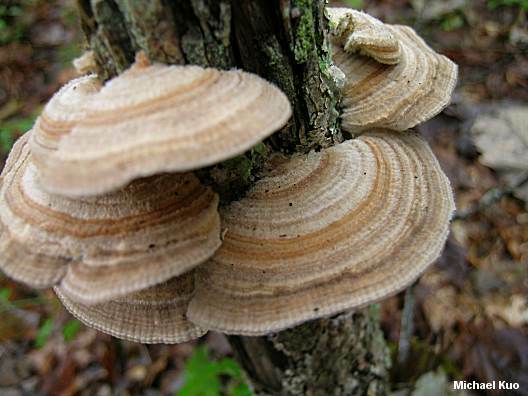 There are actually several "gilled polypores," but distinguishing Lenzites betulina from the others is a fairly easy matter. It has stark white gills (when young and fresh), and white flesh, while the others--mostly in the genus Gloeophyllum--have darker gills and rusty brown flesh that turns black in KOH. 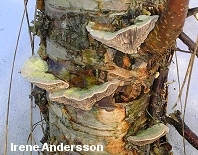 Ecology: Saprobic on the deadwood of hardwoods and, occasionally, conifers (originally named betulina by Fries, in Sweden, on the basis of its association with birch--demonstrated in Irene Andersson's photo of the species in Sweden--but later discovered to be cosmopolitan in its host preferences); annual; growing alone or in overlapping clusters on logs and stumps; producing a white to straw-colored rot of the sapwood; summer and fall; widely distributed in North America. 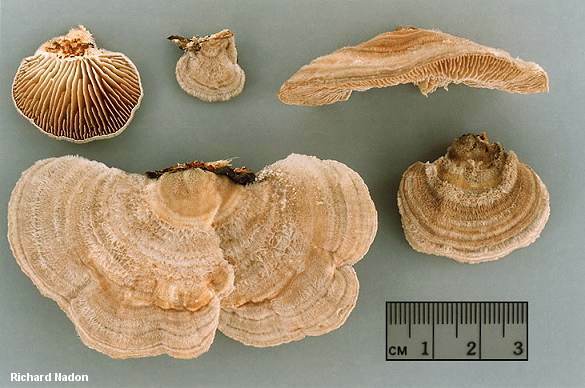 Cap: Up to 10 cm across and 2 cm thick; semicircular, irregularly bracket-shaped, or kidney-shaped; flattened-convex; densely hairy, with concentric zones of texture; often radially bumpy or ridged; with zones of whitish, grayish, and brownish colors; flexible; without a stem; sometimes developing greenish colors in old age as a result of algae. Gills: Whitish; well-spaced or fairly close; sharp; tough; up to 1 cm or more deep. Flesh: White; extremely tough and corky. Chemical Reactions: KOH negative on flesh. Microscopic Features: Spores 5-6 x 2-3 µ; smooth; cylindric; inamyloid. Cystidia absent. Hyphal system trimitic. REFERENCES: (Linnaeus, 1753) Fries, 1838. (Fries, 1821; Saccardo, 1887; Overholts, 1953; Smith, Smith & Weber, 1981; Arora, 1986; Gilbertson & Ryvarden, 1987; Phillips, 1991/2005; Lincoff, 1992; Barron, 1999; McNeil, 2006; Binion et al., 2008; Kuo & Methven, 2010.) Herb. Kuo 10010405, 10200701. What, If Anything, Is a Gilled Mushroom? In the title to a notorious paper, A. E. Wood (1957) asks: "What, If Anything, Is a Rabbit?" At issue is whether or not the label "rabbit" actually refers to anything scientifically coherent--to a group of organisms, say, that are related and share features that are not shared with other groups. Wood concludes that "rabbit" probably is a term with some scientific meaning--but a more recent essay by S. J. Gould (1983) entitled "What, if Anything, Is a Zebra?" summarizes fairly convincing evidence that there is no such thing as a "zebra," from a scientific standpoint consistent with evolution. In short, the evidence is this: there are three species of zebras, and two of them are more closely related to horses than they are to the third zebra species--which means that the two groups of zebras evolved their stripes independently, since horses have no stripes. Lenzites betulina demonstrates that the question "What, If Anything, Is a Gilled Mushroom?" is worthy of consideration. It is a gilled mushroom in the polypore order, Polyporales, which diverged from the gilled mushrooms, the Agaricales, many eons ago. 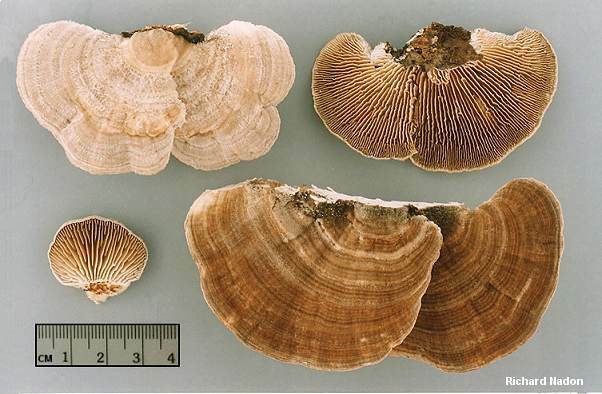 In other words, there is no such thing as a "gilled mushroom" if, in applying the term, we want to convey a sense of how mushrooms are related, since Lenzites developed its gills independently, irrespective of gill development on other branches of the mushroom evolutionary tree. In general, two reasonable scientific answers have been provided to explain examples of "convergent evolution" like the stripes on "zebras" or the gills on Lenzites betulina (a third answer, that convergent evolution reflects evidence of a Designer's Grand Plan, is neither reasonable nor scientific). One set of answers maintains that the common ancestor of the organisms in question carried the genetic potential for the feature (gills, in our example), and that the separate evolutionary lines, having inherited this potential, later expressed it. A second set of answers--not necessarily in conflict with the first set--maintains that the forms available to an organism are necessarily constrained by the laws of earthly physics (gravity, light, and so on), so that evolutionary forms cannot just develop willy-nilly, but must fall within a limited set of physics-bound possibilities in order to succeed. To be rigorously accurate, there are many more than "two" kinds of scientific answers to the question of what constraints are involved with natural selection and evolution, and the matter is far from being settled among biologists. It appears that both genetic potential and physical constraints are indeed involved--but other factors, including random genetic "drift"--are also apparently operative. For a thorough account of current biological thinking about these questions, I highly recommend Massimo Pigliucci's "Lost in Phenotypic Space: Why Do Living Organisms Look the Way They Do?" (citation below). But the term "gilled mushroom," as any mushroom hunter knows, is perfectly valid as a way of describing and identifying mushrooms, regardless of whether it represents a coherent scientific term. And it should be pointed out that in the case of Lenzites betulina we cannot blame the "DNA people" for the mess we are in when it comes to classifying (as opposed to identifying) the mushroom; we have thought of it as a "gilled polypore" for centuries, and any mushroomer who sees the thing in the woods is likely to reach the same conclusion. 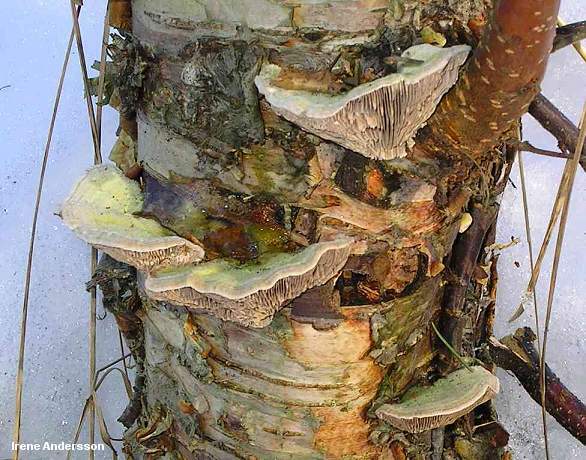 DNA studies have merely verified (for once) our previous observations--which leads us to another question: "What, if anything, is a polypore?" If it is the case that just about any mushroomer is likely to look at Lenzites betulina and decide it is a polypore despite its gills, what is the operative and probably subconscious definition of a "polypore?" It obviously isn't the presence of pores! I find it interesting that many of the mushrooms that put us in awkward taxonomic positions (like Lenzites betulina or the "Gilled Bolete," Phylloporus rhodoxanthus, or Schizophyllum commune) are very widely distributed and cosmopolitan species, able to adapt to many kinds of environments in diverse geographical locations. I offer this thought merely as an observation, since I am decidedly not qualified to develop any theoretical explanations for the (apparent) phenomenon; though several arm-chair biologist ideas come to mind, I will spare you the, um, brilliant insights. Gould, S. J. (1983). What, if anything, is a zebra? In Hen's teeth and horse's toes: Further reflections in natural history. New York: Norton, pp. 355-365. Wood, A. E. (1957). What, if anything, is a rabbit? Evolution 11: 417-425.